Oh, the weather outside is...65 and sunny? It's not beginning to feel much like Christmas. Don't get me wrong. I'm enjoying this respite from the gray, South Carolina drearies immensely. After all, this former northern girl remembers many brutal days, driving to work at the publishing company in the Chicago 'burbs, with the wind chill registering -30 degrees. Or wading through the lake effect snow. Or shoveling the driveway, only to have it covered fifteen minutes later by the snow plow. No, I will never complain about southern winters. Thank goodness for warm weather. While other folks are decking the halls this weekend, I'll be digging new beds for my tulips, peonies, iris, and fritillaria. Although I'm an epic fail with Christmas blooms this year, I did take a break from the baking fury that's consumed me today to take a stroll outside. Our daughter's schizophrenic cherry tree. While I love this tree, because we planted it for Kristen when she was born, it is, honestly, a stupid tree. Who needs cherry blossoms in December? 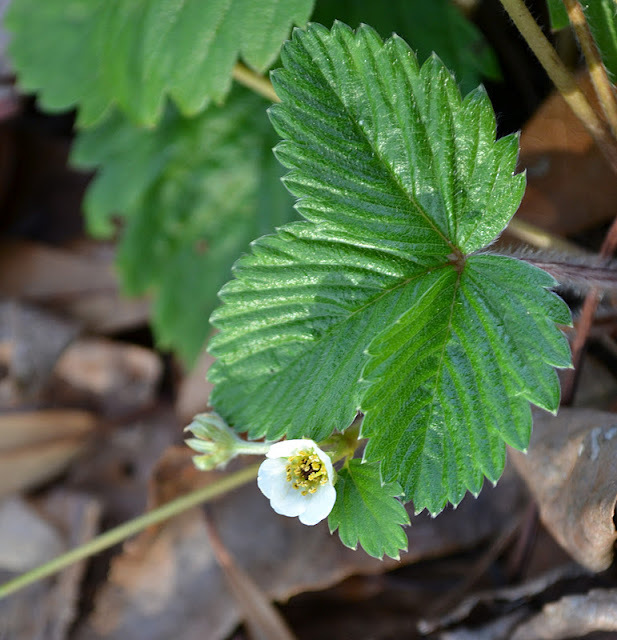 I do, however, love, love, love the blooms of the fraise des bois. Somehow, the blooms of these little gems remind me that spring--and fresh strawberries--and not too far away. Thank you, camellias, for hanging in there through December. The blooms are starting to look tired, but I found a few that were photo worthy. A rogue calendula bloom! What in the world are you doing, little flower? Don't you know you should be dormant? Oh...maybe it's that thick layer of leaves that I never cleared out of the herb beds...it's giving you some nice insulation, huh? OK, so I'm cheating a bit. No, these aren't technically blooms...but I'm just thrilled that our potager continues to produce throughout the winter. I'm especially excited because I planted the fall garden late. To protect the produce, I've been covering the garden anytime the temperature dips into the mid-30s. So far, so good. Crossing fingers that I don't get lazy one night and forget! ...ridiculously adorable little flowers, aren't they? Honestly, look at its little face--it looks like a supermodel with false eyelashes and collagen enhanced, pouty lips. The beauty of South Carolina--we plant our pansies in the fall to enjoy all winter and into early spring. Thank goodness for their splash of cheerfulness. We gardeners who live in SC are pretty darn lucky. We can usually grow something year round. Still—I have to admit, last Christmas was amazing. It snowed. On Christmas. It was a South Carolina miracle. I'm hoping for a repeat. Even if it means I won't have any blooms to share for January.